L&T Raintree Boulevard: Homes that mean panache! L&T is a name that is known for its massive undertakings in private and public constructions as they have executed huge infrastructure and construction projects all over the country for many decades. Their own real-estate arm called L&T Realty has been changing the game of positive, stupendous and great quality architecture. Their latest addition in the ‘Silicon Valley of India’, Bangalore, is the L&T Raintree Boulevard. The project is a huge expanse of 65 acres that is marked with the amazing design with flawless execution, using the latest in construction quality. The hi-tech campus has a master plan that shows planned roads, green spaces, areas for amenities and interspersed with towers that contain posh homes. The location is perfect. L&T Raintree Boulevard Bangalore stands proudly at Hebbal. It is near the Columbia Asia Hospital. 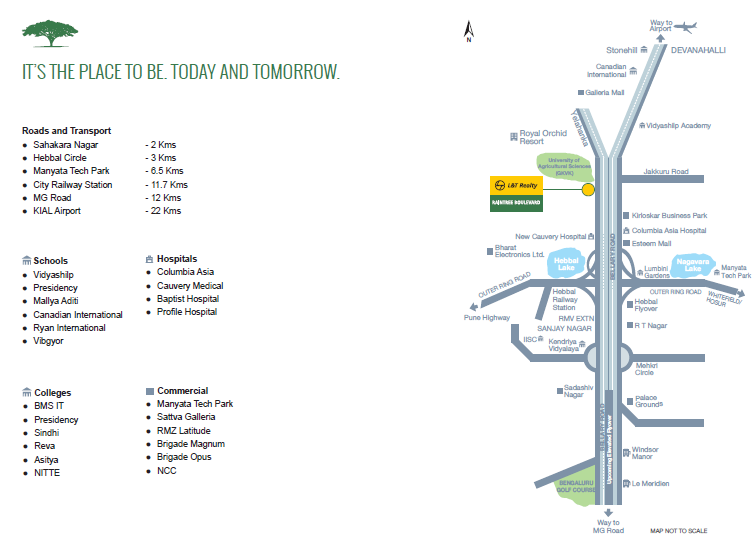 Manyata Tech Park, MG Road, BIAL Airport, City Railway Station and Shankar Nagar are all close by. Hebbal is anyways nourishing many suave developments in commercial and residential sectors. This prime development is a fine campus that boasts of a traffic-free central zone. The complex offers 2, 3 and 4 BHK apartments in dissimilar styles to meet the different needs of clients. Thus, it brings unity in diversity and blends them all beautifully. Homes here occupy areas in the range of 1320 sq. ft. to 2790 sq. ft. Each home has a smart layout, bedrooms with attached baths, a modern kitchen and trendy bathrooms. The tiled floors in balconies and inside the homes render a contemporary finish. The homes are futuristic as they provide for features like spilt a/c in each room. Wide balconies and large windows welcome nature and freshness along with lovely views. A utility area is well planned for practical needs. The facilities here are many and multi-fold. There is a clubhouse, a kids' own nursery, a library, bank ATM, and even a playground for kids. Sports areas, swimming pool, gym, multipurpose hall, an open theatre and open green gardens adorn the property. L&T Raintree Boulevard Hebbal Safety is of prime importance here, as is convenience and green living. There is provision for water supply, fire-fighting equipment, skilled maintenance staff, security, sewage treatment plant, etc. here. Truly, the placeis an address that spells class and luxury all the way. The greenery cuts out noises and offers a natural haven inside the secure boundaries. L&T Raintree Boulevard Price ranges from Rs 93.72 lakhs to Rs 1.98 crores. With convenient payment plans and tie-ups with leading banks & financial institutions, you need not to worry about your finances for booking a unit inside this premium complex. Live in a modern paradise, backed by the reputed L&T brand and forget worries, as you enjoy every moment! With the inauguration of the Bengaluru International Airport at Devanahalli, several localities that were once considered to be in outskirts of the city gained attention of the realty developers. Hebbal the once outside limit of north Bangalore became an important transit point with all the arterial roads cutting across this area. With the rapid urbanisation of the area the properties in Hebbal became sought after addresses for the workforce of the city.Civic amenities are quite well-developed in the area and it has access to clean water from Cauvery river.The region is divided into two major geographic areas namely the Manyata Embassy Business Park and the radius of 3 km from Hebbal Lake along the Bellary Road. The apartments in Hebbal are accompanied by prominent schools, hospitals, malls and more. A mixed use township spread across 65 acres of pristine greens that has been conceptualized on urban green courts having two main boulevards lined by trees. Cluster will be developed around central green landscape. Well-designed 3 & 4 bedroom apartments in variants. Safety, security & fire-fighting systems. Exclusive cycling and jogging tracks. Large traffic-free podiums; safe walk / play zones for both the young and the aged. power to certain common areas. Sewage treatment plants to treat the sewage and use the treated water for flushing & gardening. Organic garbage waste & the treated sewage sullage will be converted into natural manure / compost using Organic Waste Composter. All homes at L&T Raintree Boulvard have vitrified flooring for the house. Master Bedroom have wooden flooring, Kitchen have matt finishes tiles, Bathroms and Balconies have anti-skid tiles. They have an excellent track record with the projects that they have delivered. L&T Raintree Boulevard is really a nice residential project to invest as it gives great returns. The main thing about this project is it has close connectivity with various locations like Outer ring road, Mumbai-Bangalore Highway, AH-47, NICE Ring road etc. The location of the project is also a great option to choose. It is totally packed with modern amenities too. So it is a full package for comfortable living. L&T Raintree Boulevard is a nice project by L & T realty the best part however is the location which is Hebbal, Banglore. The amenities that are been offered are also very interesting.